Learn The Pokerfather's simple mathematical trick to estimate your Poker Hand Odds in 5 minutes...trust me it's worth it! Unless you are a talented mathematician, it is very hard to calculate or estimate the precise odds of getting your drawing hand when you're sitting at a poker table. This now leaves you with two possible options: The first option is buy a calculator and calculate all the odds for every single possible combination of draws out there (A LOT!) and then memorize them. This way, no matter what situation arises, you always will know the odds you face (no estimating needed). However, most of us do not have a photographic memory, and furthermore, there is an easier way! 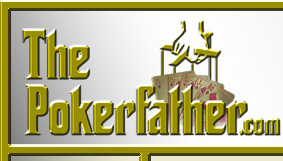 The second option, and the easier option, is too learn The Poker Father's simple trick for calculating / estimating your poker odds. The first thing you need to determine is how many "outs" you currently have (an "out" is any card that gives you a possible made hand). In order to do this, count the total number of cards available that give the hand you are currently drawing to. For example: lets say you hold an 'Qd' & '6d' and on the flop a '10h', '7d', & '2d' turn up. You now have a possible flush draw. There are thirteen diamonds in the deck and you have four of them - the two that are in your hand plus the two that flopped on the board. This now leaves a possible nine diamond cards left in the deck, and you have two chances to hit at least one of them (the river card and/or the turn card). To figure out the estimated chance (in percent form) of hitting your flush is to multiply your number of outs (9) by the number of chances available to hit it (2). In the above example, you have nine outs multiplied by two chances, which equals eighteen. Then take that number (18) and multiply it by two, and then add the percent sign. 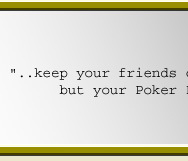 So, 36% of times you will make your flush. Not bad considering the real calculated percent is 34.97%. One important thing to remember is that the estimated percent is ONLY the percent of you making the hand you are going for and NOT the percent of times you will win the pot. You may have hit your target hand but you could still lose. In the first example, if a '10d' were to turn up you would hit your flush, BUT the '10d' would pair up with the '10c' on the table and could give someone a full house. You would then lose even though you hold a flush. In the second example, say a 'Jd' and a'6d' were to come on the river and the turn. You would have hit your straight, BUT, it there is also a GOOD possibility that there is flush out there. Again, even though you hit your hand, you could still lose to the flush. 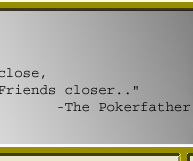 Knowing the estimated likelihood of making your hand is a good starting point of becoming a better poker player. Furthermore, you should not only be calculating your outs, but also your opponents outs as well. Knowing your opponents possible hands (and percents) will allow you to bet strategically.